A core part of our mission is to build our communities and educate people about sustainability across the food systems. The Student Farm hosts events throughout the year in order to support that mission. Follow our Facebook page for the most up to date information on upcoming events. Below is an archive of past events. Our annual events include: Harvest festival, typically held in early Septembe,r and our annual Summer Solstice celebration, held near the summer solstice. Our events are sometimes on the farm but also take place around the community. They’re typically open to everyone, not just students, and often feature kid friendly programming for families. 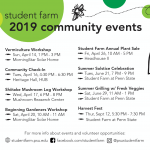 The Student Farm is hosting several events in the upcoming spring season. Follow us on Facebook for more updates, and feel free to click on this picture to get quick dates and times. Finish out your Arts Festival week with some relaxing arts and crafts and farm-fresh snacks! 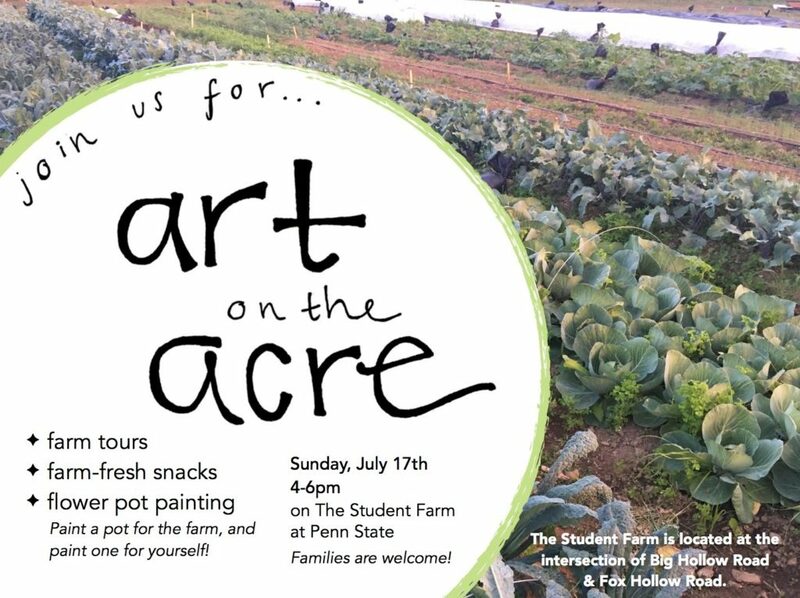 On July 15th, come out to the one-acre Student Farm near the intersection of Big Hollow and Fox Hollow roads from 4 to 6 p.m. to enjoy a beautiful afternoon of farm-art fun and farm tours. The free, family-friendly event will include vegetable-based tie-dying and intern-led, educational farm tours. Kids will learn about different varieties of vegetables and herbs, how our food is grown, and how the crops they see on the farm can be transformed into food they can eat, and art they can create. Guests will be able to tie-dye fabric for bracelets, handkerchiefs or necklaces that they can take home, and enjoy seasonal farm-fresh snacks as well. Guests are encouraged to wear sturdy shoes, as well as bring a water bottle and sunscreen. The mission of the Student Farm is to educate people about sustainable food systems, cultivate community, and increase access to local foods on campus and in our community. Directions to the Student Farm can be found here. In the unfortunate case of poor weather, look for updates on the Student Farm at Penn State’s facebook page. 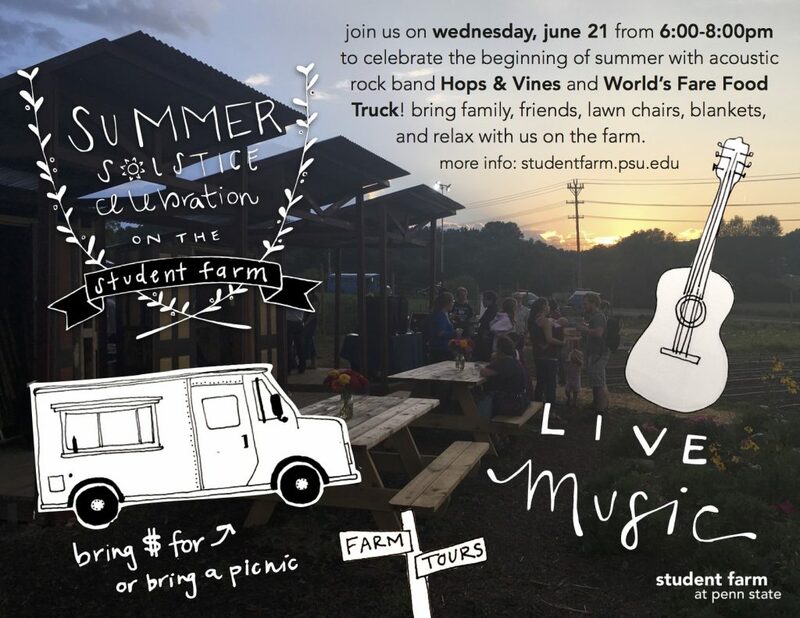 Enjoy live music, fresh food, and good company at the Summer Solstice Celebration at the Penn State Student Farm on June 21st, the longest day of sunshine all year! From 6 to 8 p.m., engage with other farm-goers, take a tour of the farm, visit our community partners’ tables, or just soak it in and relax! State College-based Taste Buds Kitchen will be serving fresh and flavorful food, and Hometime, a local band, will provide the musical entertainment. There will be picnic tables set up at the Student Farm, but to be safe, bring those picnic essentials—blankets and chairs! In the unfortunate case of poor weather conditions, guests should check the Student Farm Facebook Page for updates. 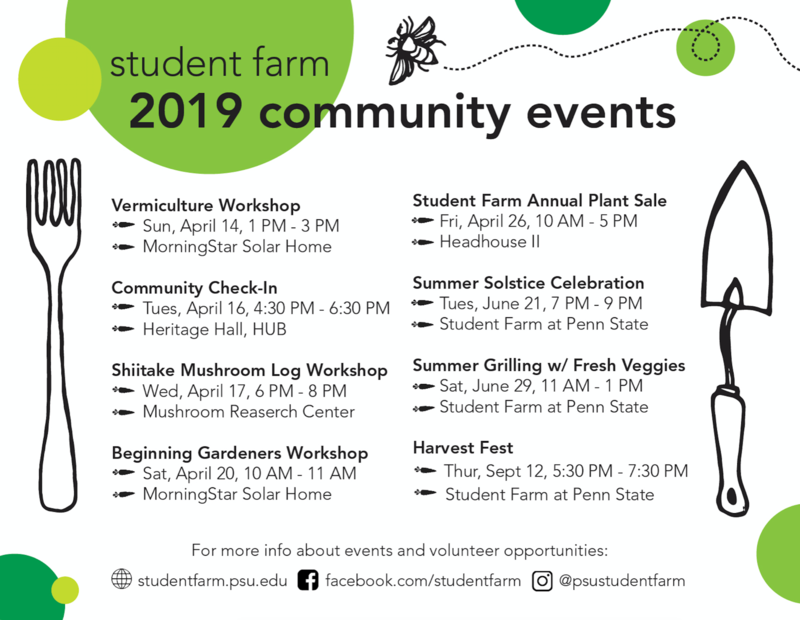 This is the second-annual Summer Solstice Celebration hosted by the Penn State Student Farm, and we are excited to extend the invitation to all. This event hosted over 200 people last year, but we can top it! We hope to see you there! 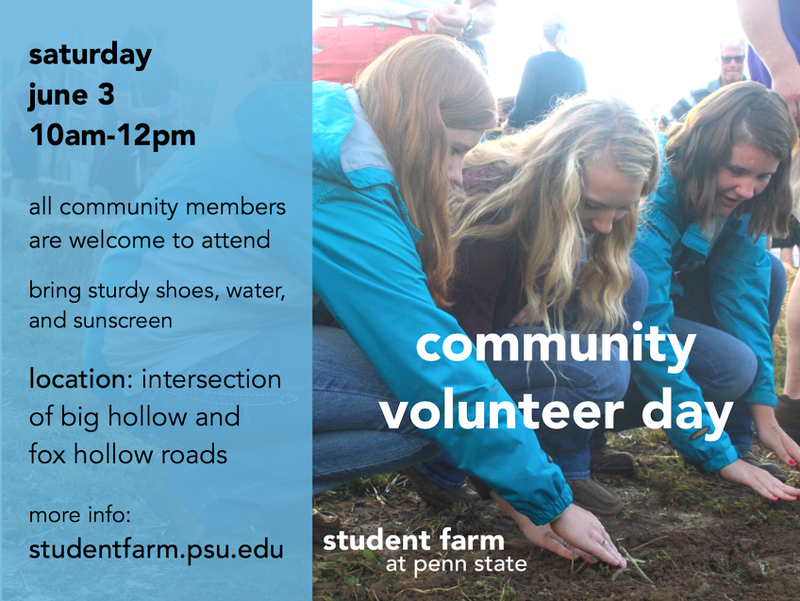 Come out to the Penn State One-Acre Student Farm on Big Hollow Road to get your hands dirty! Jump in to a great volunteering experience–where you’ll harvest some veggies and meet new people! Community Volunteer Day on the Farm is something very special. This day is one where we all can come together to attain a common goal: helping the Farm and helping the community. With your helping hands, we can produce farm-fresh food right from the dirt to your dinner table, and be social doing it! You will meet new people, build new relationships, and have a rewarding day of volunteering to keep in your heart forever! Think spring- revitalize your home garden, apartment or dorm with beautiful, local plants grown in the Penn State greenhouses by Student Farm Club members. A variety of more than 30 vegetable plants, herbs and succulents will be available for sale on Friday, April 27 from 10 a.m.-5 p.m. in Headhouse 2, across from the Berkey Creamery on Curtin Road. Don’t miss this wonderful opportunity to get your spring seedlings, redecorate your home and support a great cause benefiting students. Plants available for sale this year include: succulent and herb varieties, tomatoes, watermelon, peppers, eggplant, broccoli, squash, kale, cucumbers, Brussels Sprouts and more! In addition to plants and succulents, Student Farm merchandise will be available for sale. The early bird gets the worm- the number of plants available are limited, and will be sold on a first-come, first-served basis. Accepted forms of payments include cash or check. Please remember to BYOB (bring your own bag) to transport seedlings and plants. All proceeds benefit the Student Farm Club. Spring is coming! For everyone eager to work with living, growing things, the Student Farm has two upcoming workshops that offer attendees an opportunity to get their hands in the dirt: Build-Your-Own Worm Compost System and Shiitake Mushroom Logs. Are you interested in learning about shiitake mushrooms and mushroom growing? 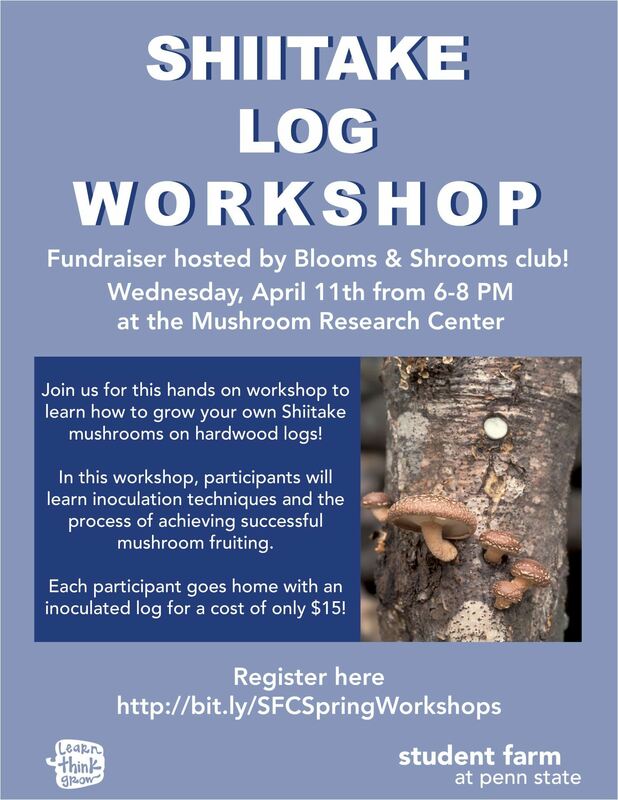 Blooms and Shrooms Club will host a Shiitake Log Workshop on Wednesday, April 11 from 6-8 p.m. at the Mushroom Research Center on Penn State’s campus. This workshop will cover the basics of shiitake mushroom log inoculation and the process of achieving successful mushroom fruiting. All proceeds from this event will benefit the Blooms and Shrooms Club. Registration for both workshops is limited- register today! When you register, you can choose to attend for free and help build worm compost systems or shiitake logs for the Student Farm, or for only $15 you can build your own worm compost system or shiitake mushroom log to take home. Payment instructions will be sent by email upon registration. Cold weather and snow have you feeling down? 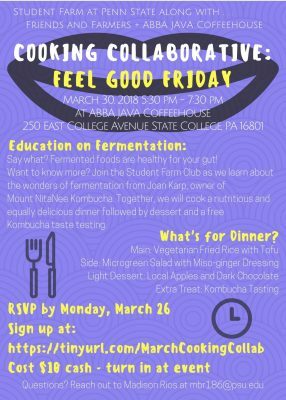 Join the Student Farm Club for “Feel Good Friday,” the second Cooking Collaborative event of the semester on Friday, March 30 from 5:30 – 7:30 pm at Abba Java Coffeehouse. 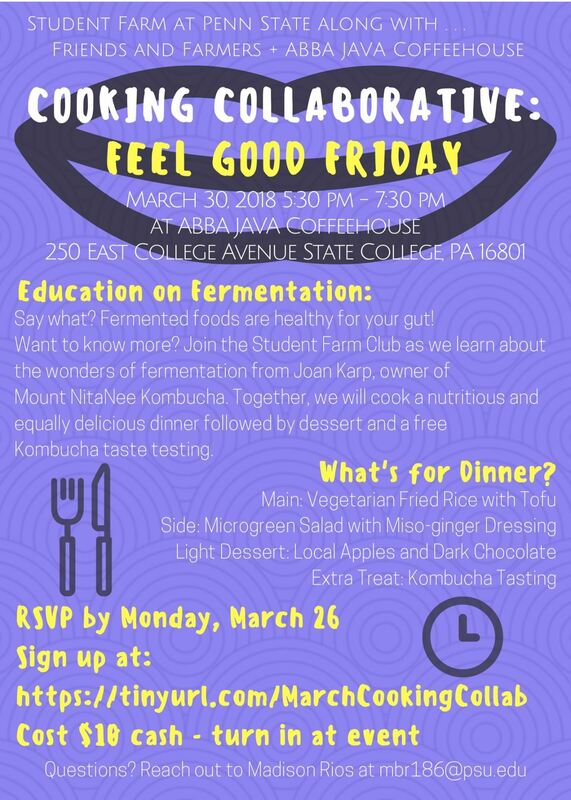 Prepare and enjoy a delicious local meal and learn about the health benefits of kombucha and fermenting from Joan Karp, owner of Mount NitaNee Kombucha. 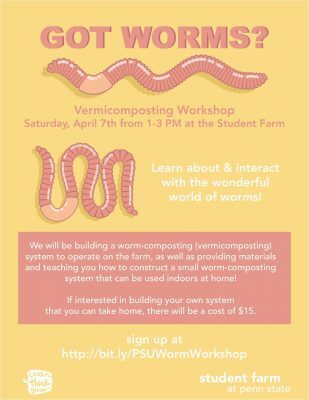 Are you interested in learning more about vermicomposting (worm composting)? These hungry worms can eat their body weight each day in food scraps and other compostable waste. Find out how this system can help you reduce waste and provide fresh soil at the Student Farm Club’s Vermicomposting Workshop on Saturday, April 7 from 1 p.m.- 3 p.m. on their one-acre site. The workshop, led by club members Ben Chronister and Paul Laudenslayer will cover the basics of vermicomposting and attendees will help build a system to use on the Student Farm. The systems can be used at home indoors. The cost of attending the workshop is free, but if you’re interested in building your own to take home the cost is $15. Please sign up here to register for the workshop. How the system works: Earthworms eat organic material recycled into your compost bin. The excrements left behind by these worms can be added to soil in order to improve its overall health, and physical, chemical and biological properties. Your vermicompost bin can be stored at home indoors. Each semester at University Park, enough food is wasted to feed 4 sold-out home football games. In an effort to raise awareness of this important issue, Student Farm Club, Eco-Action, PSU Veg Club, and Healthy PSU have organized Food Waste Awareness Week: a series of events open to all students and community members to learn about the issue of food waste and what they can do to reduce their own. The events hosted during the week include a free screening of the film, ‘Wasted! The story of food waste’ and a sustainable dining event, ‘Food for Thought’. The free screening of ‘Wasted! 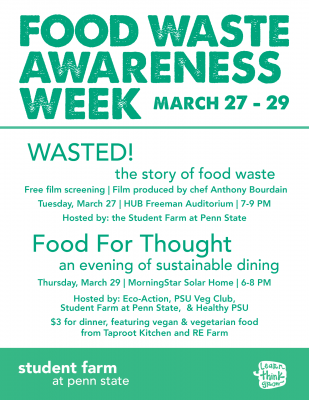 The story of food waste’ will take place on Tuesday, March 27 from 7 p.m.- 9 p.m. in HUB Freeman Auditorium. A short panel discussion led by student sustainability leaders will follow the film screening to answer questions about Penn State’s food waste. ‘Food for Thought’ will take place on Thursday, March 29 from 6 p.m. – 8 p.m. at the MorningStar Solar Home. The cost of dinner is $3, which features delicious vegetarian and vegan food options from local partners Taproot Kitchen and RE Farm. Cooking Collaborative is back! 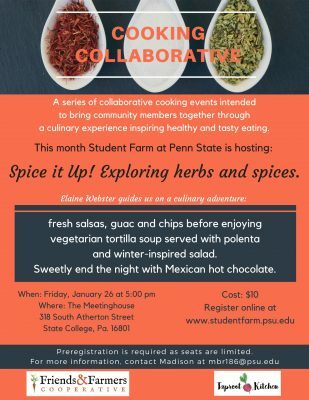 The Student Farm Club will host their first Cooking Collaborative session on Friday, January 26 at 5 p.m. at the Meetinghouse on South Atherton Street. The cost is $10, and make sure to preregister because spaces are limited. Payments will be collected at the door before the event. Preregister here to reserve your space! Join us in celebrating our biannual exposition of student projects supporting sustainability in our community. Teams and groups of students will share their community-based projects and research in this poster session. This showcase will take place on Thursday, December 7 from 4:30 p.m. – 6:30 at the State College Borough Building on South Allen Street. 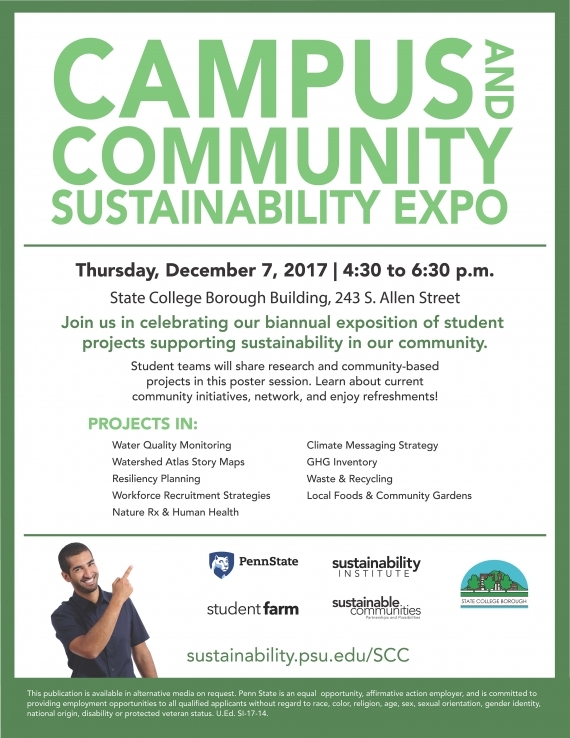 Enjoy fresh snacks from Webster’s, network with students and learn about the innovative community projects and research happening in our community to promote sustainability. Join us and the College of Arts and Architecture Ambassadors for an evening of delicious food and inspiring conversation on Wednesday, November 29 from 5:45 – 7 p.m. at the Stuckeman Family Building Jury Space. This event is open to all students, faculty, staff and community members. 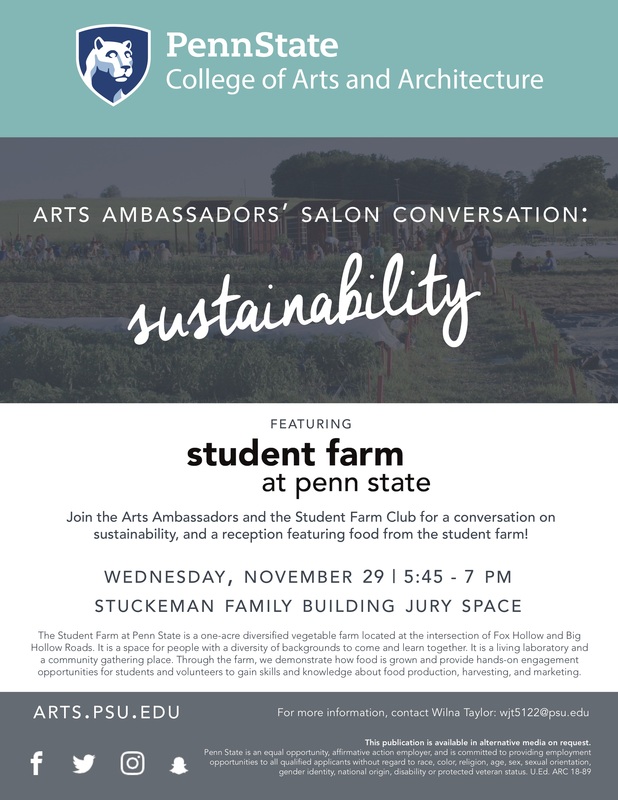 The Art Ambassadors will lead a discussion on topics relating to on-campus and community sustainability here at Penn State. 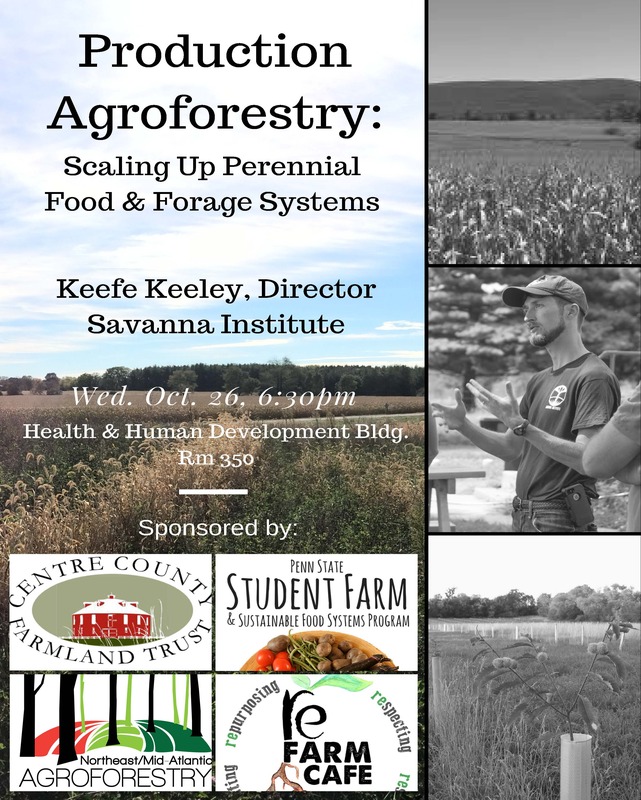 The discussion will be followed by a Student Farm-fresh snack and opportunity to network with other student organizations and leaders. The Art Ambassadors are an organization that represents College of Arts and Architecture students and promotes the arts throughout Penn State and the local community. Please RSVP here for the salon. Are you interested in learning about sustainability efforts and food systems programs at other universities? 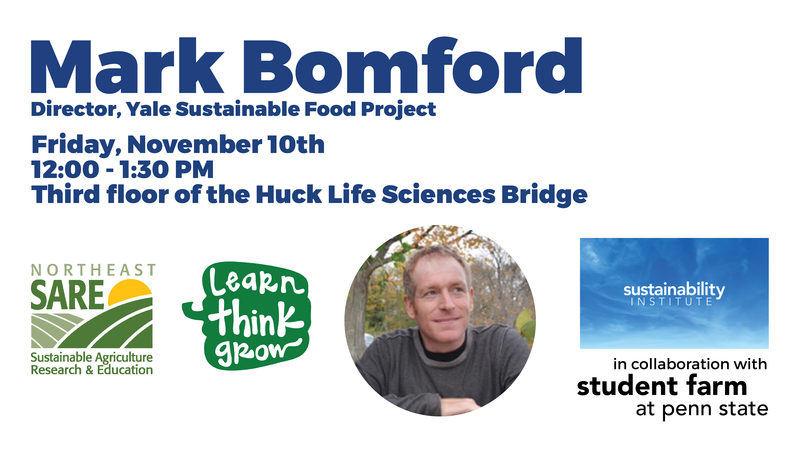 Join us for a special guest, Mark Bomford, Director of the Yale University Sustainable Food Program as part of the Sustainability Showcase on Friday, November 10 at 12pm on the third floor of Huck Life Sciences Bridge. Established in 2000 by a group of passionate students, the Yale Sustainable Food Program has become a vital aspect of dining on-campus and sustainability efforts, and has provided countless interdisciplinary educational opportunities for students at Yale. 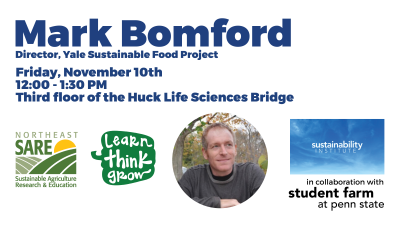 Mr. Bomford has served as the program director since 2011 and also teaches a seminar at Yale entitled, “Approaches to Sustainable Food and Agriculture.” One of Mr. Bomford’s major goals in directing the program is to position the Yale program at the front of global food systems conversation and movement. As part of the Showcase, Mark plans to address how the Yale program interacts with other food systems efforts both on campus and in the local community, some of the positive impacts of the program, and why university support of food systems programs is so important. Mark will also be speaking during the Student Farm Club meeting in 215 Armsby on Thursday, November 9 from 6-7pm. All are welcome to attend this talk as well. 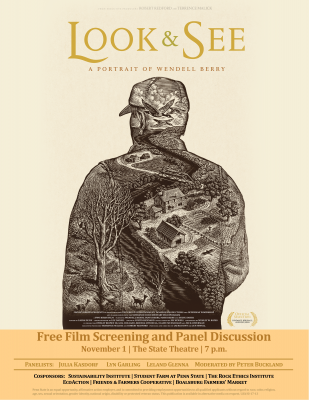 A screening of the award-winning Sundance documentary “Look & See,” a powerful cinematic portrait of Wendell Berry—farmer, activist, and one of America’s most significant living writers—will take place at 7 p.m. on Nov. 1 at the State Theatre in downtown State College. The screening is free and open to the public. Often called “a prophet for rural America,” Berry has long been a voice for the communities that are so often overlooked by the media. In 1965, Berry returned home to Henry County, where he bought a small farmhouse and began a life of farming, writing and teaching. This lifelong relationship with the land and community would come to form the core of his prolific writings. A half century later, Henry County, like many rural communities across America, had become a place of quiet ideological struggle. In the span of a generation, the agrarian virtues of simplicity, land stewardship, sustainable farming, local economies and rootedness to place have been replaced by a capital-intensive model of industrial agriculture characterized by machine labor, chemical fertilizers, soil erosion and debt—all of which have frayed the fabric of rural communities. Filmmaker Laura Dunn weaves Berry’s poetic and prescient words through cinematography and the testimonies of his family and neighbors, all of whom are being deeply affected by the industrial and economic changes to their agrarian way of life. Co-sponsors of the event include Penn State’s Sustainability Institute, the Student Farm at Penn State, Rock Ethics Institute, EcoAction, Friends and Farmers Cooperative and the Boalsburg Farmers’ Market. For more information regarding the event, contact Peter Buckland. Bite into a crisp, fresh apple and find your taste of autumn at the Penn State Apple Celebration on Thursday, Oct. 26 from 12p.m. – 5p.m. on the green space next to the Creamery on Penn State’s campus. 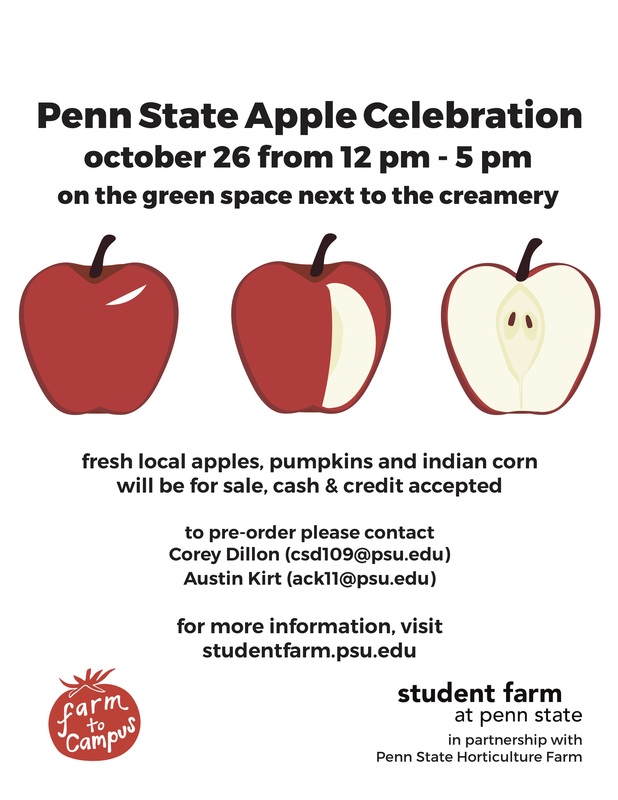 The sale will feature multiple varieties of apples grown in Penn State Horticulture Farm orchards, and guests can taste samples and pick up recipe cards to go along with their apples! The Student Farm is excited to partner with Penn State Horticulture Farm to bring fresh and local apples to the Penn State community as part of this fall celebration. The varieties of apples available for sale include McIntosh, Empire, Golden Delicious, Red Delicious, Day Break Fuji, Jonagold, Fuji, Nittany, and more! Pumpkins and Indian corn will also be available for purchase. “The local foods movement is becoming more popular, and the apples featured at this event are grown right here on Penn State land. You can’t get much more fresh and local that!” said Alex Kummerer, a Student Farm Club member. 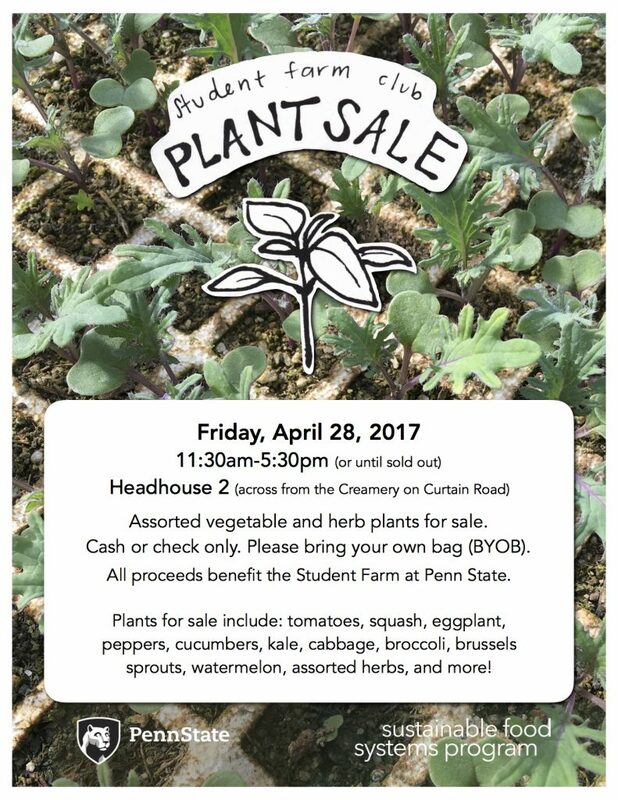 All proceeds from the sale will benefit the Student Farm Club and Penn State Horticulture Farm. Cash or credit card are accepted. Guests are encouraged to bring their own reusable bags. Pre-sale of bulk quantities is also available. Contact Horticulture Farm manager Corey Dillon at csd109@psu.edu to pre-order one-bushel quantities or more. In case of inclement weather, visit the Student Farm website for up-to-date information about the event. 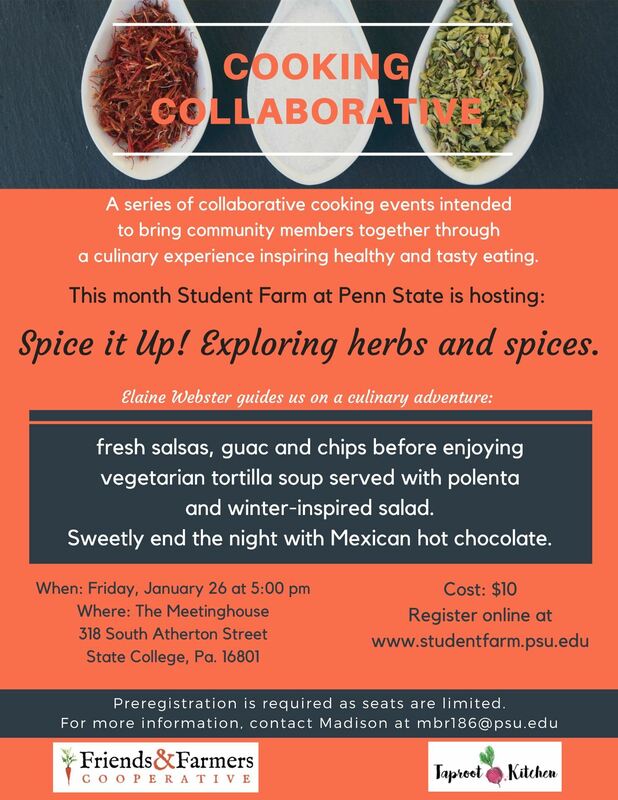 Please direct questions about the event to Student Farm Club member Madison Rios at mbr186@psu.edu. 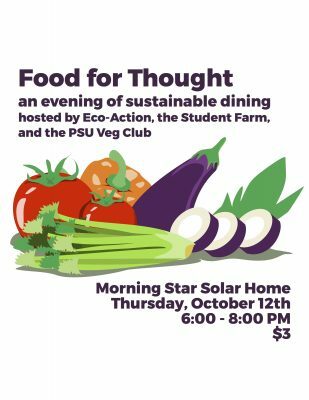 Three sustainability-minded student organizations are uniting to host “Food for Thought”- a sustainable dinner experience and discussion about sustainable food choices. 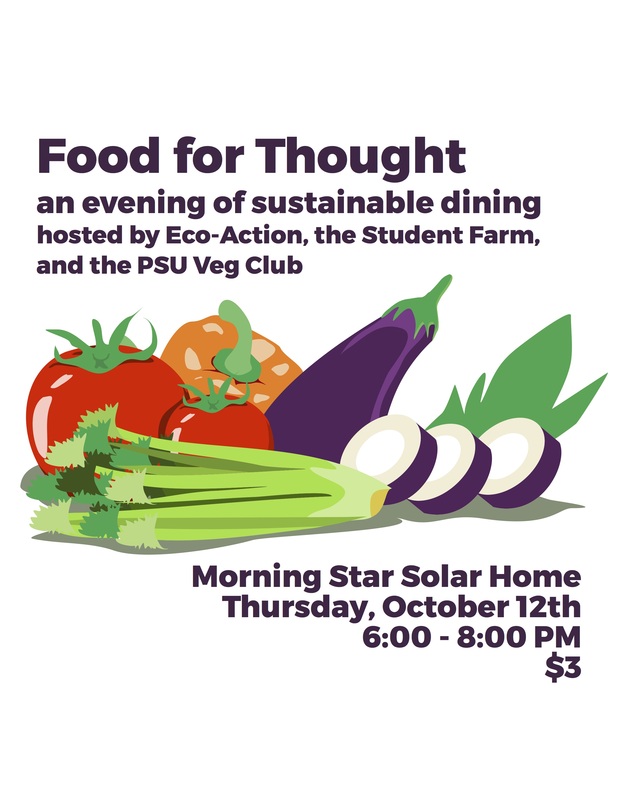 This event hosted by Eco-Action, PSU Veg Club, and the Student Farm at Penn State will take place on Thursday, Oct. 12 from 6 p.m.- 8 p.m. at the MorningStar Solar Home on Penn State campus. All students and members of the community are invited to attend the dinner and discussion. The vegetarian and vegan meals will cost $3, and will feature food grown on the Student Farm, the Horticulture farm, the Research Farm at Rock Springs and more! The $3 cost for the meal will be collected at MorningStar Solar Home upon entrance to the event. We are only accepting cash. Help us tuck the farm in for the winter! 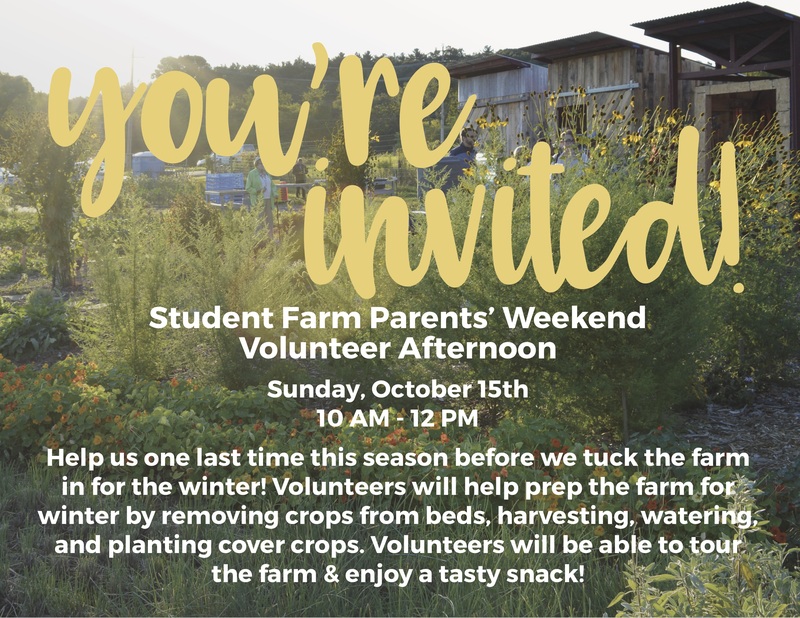 Join us for a community volunteer afternoon on Sunday, Oct. 15 from 10 a.m. – 12 p.m. to help prepare farm beds for winter, harvest crops, and plant cover crops. This volunteer afternoon is open to all members of the community, and to students and parents as part of Penn State Parent’s Weekend. There will be farm tours available towards the end of the afternoon and snacks will be provide for volunteers. Volunteers are reminded to wear sturdy shoes and to bring a water bottle. Children under the age of 18 must be accompanied by a parent or guardian. All students and community members are invited to this free event on Thursday, Oct. 5 from 5 – 7 p.m. in room 215 Armsby, located on University Park campus. 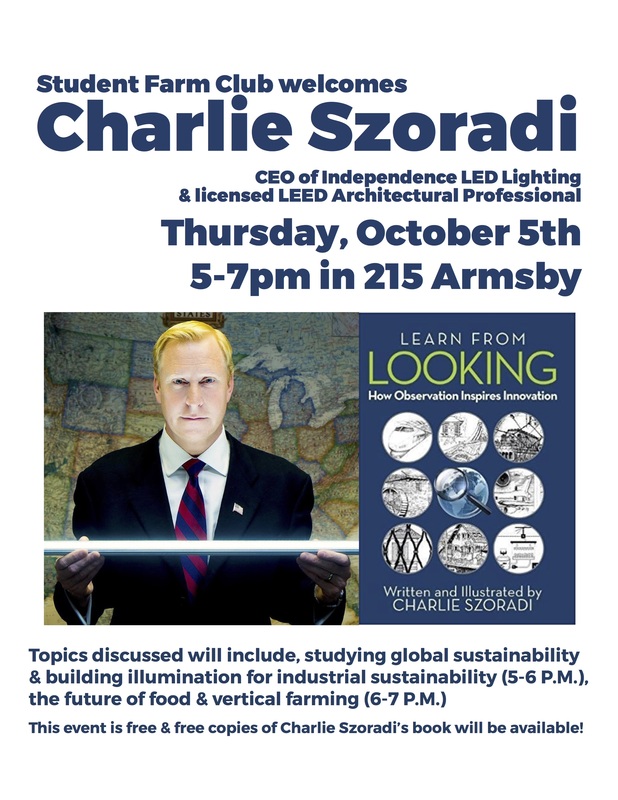 Szoradi will begin the evening speaking about his background traveling the world to study global sustainability. He’ll also share his experiences as CEO of an industrial LED lighting company that manufacturers energy-saving lights in Pennsylvania. Szoradi’s focus in all business is sustainability and the triple bottom line: planet, people, profit. 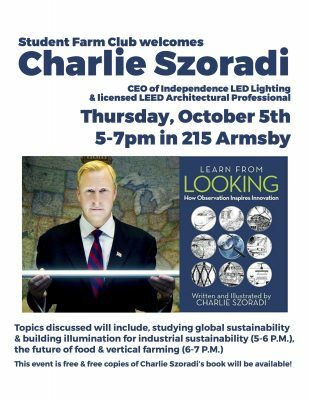 Szoradi will speak about the future of food and address a potential business model for vertical farming, which is a new innovative form of food production. The method combines sustainable indoor methods, such as hydroponics and aeroponics, with cutting-edge technology such as LED lighting. Following his lecture and discussion, there will be a question and answer session with Mr. Szoradi, and he will be giving away free copies of his newest book. EVENT UPDATE 10/2: Local Foods Night (the meal) has been moved to Wednesday, Oct. 4 from 5- 7:30. 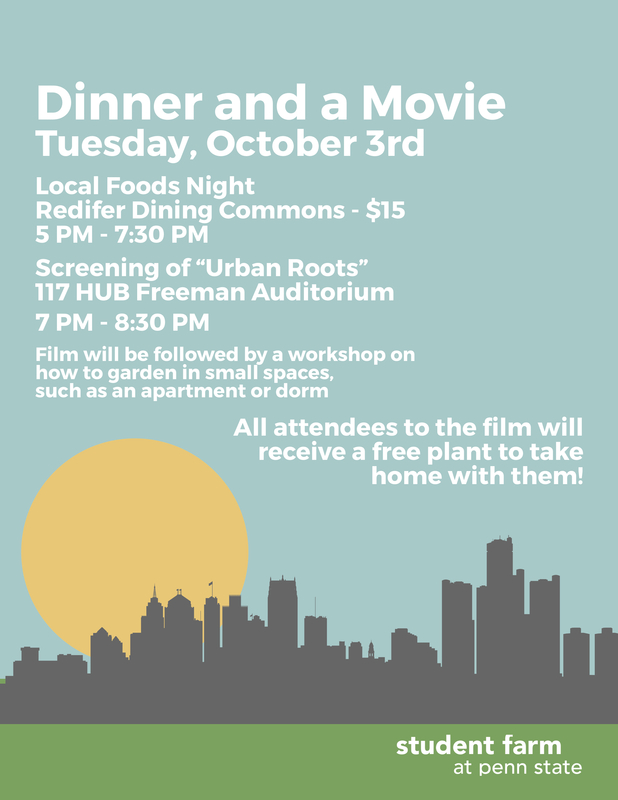 The free screening of “Urban Roots” and small-scale gardening workshop will still take place on Tuesday, Oct. 3 at 7 p.m. in 117 HUB Freeman Auditorium. Menu for local foods night: Pennsylvania Duck cooked in two ways: Leg Confit, roasted breast; baked spaghetti squash with with zucchini and concord grape jelly ($12.99). Vegetarian option: cheesy baked spaghetti squash with poblano peppers, swiss chard, and zucchini with kale pesto ($8.99). 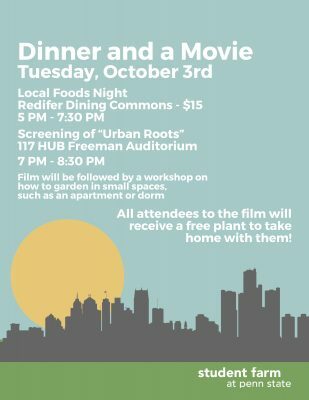 Penn State Housing and Food Services is teaming up with the Student Farm Club to provide a delicious, locally-sourced meal along with a screening of the film,“Urban Roots” followed by a gardening workshop as part of their Local Foods Night celebration on Tuesday, Oct. 3 at 5 p.m. in Redifer Dining Commons. All students and members of the community are invited to attend this celebration of local food and urban agriculture. The cost of the meal is $15, but the film screening and small-scale gardening workshop are free. Guests will also have the opportunity to take home a free plant from the Student Farm after the workshop. The film, “Urban Roots”, explores the rise of urban farming in Detroit, which led to an environmental movement in the city and changed the way people thought about food, food systems and food security. Screening of the film will start at 7 p.m. in 117 HUB Freeman Auditorium. Following the film, club members will lead a gardening workshop about how to utilize small spaces, such as a dorm or apartment! All guests will take home a plant of their choosing grown by the Student Farm Club. The Local Meal will take place from 5 – 7pm, followed by the film screening and workshop from 7 – 9pm. Enjoy a fall afternoon outdoors with family and friends getting your hands in the dirt on the Student Farm. 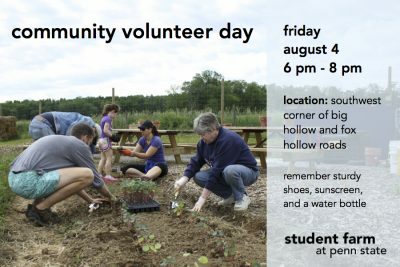 All members of the community are invited to the volunteer afternoon at the one-acre site, located at the intersection of Big Hollow and Fox Hollow Roads. Help Student Farm Club members and interns harvest produce, plant seeds, water crops and inspect plants for insects. Tours of the farm and educational activities will also be offered towards the end of the afternoon. All guests are reminded to wear sturdy shoes and to bring a water bottle. All children under the age of 18 must be accompanied by a parents of guardian. In case of inclement weather, check the Student Farm website for event updates. Celebrate the beginning of the fall season with live music, farm-fresh hors d’oeuvres, and meet the new director of the Sustainability Institute and Penn State’s Chief Sustainability Officer, Dr. Paul Shrivastava. All community members are welcome to attend this free celebration. 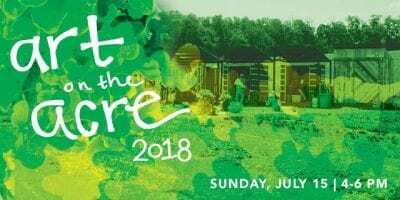 This family-friendly event will include tours of the farm and other educational activities, live music performed by Sonic Schroeder, and farm-fresh hors d’oeuvres prepared by Campus Catering. Don’t miss this opportunity to try edible flowers and other unique foods. Guests are encouraged to bring their own lawn chair or blankets and are reminded to wear sturdy shoes. In the event of inclement weather, check the Student Farm website for event updates. 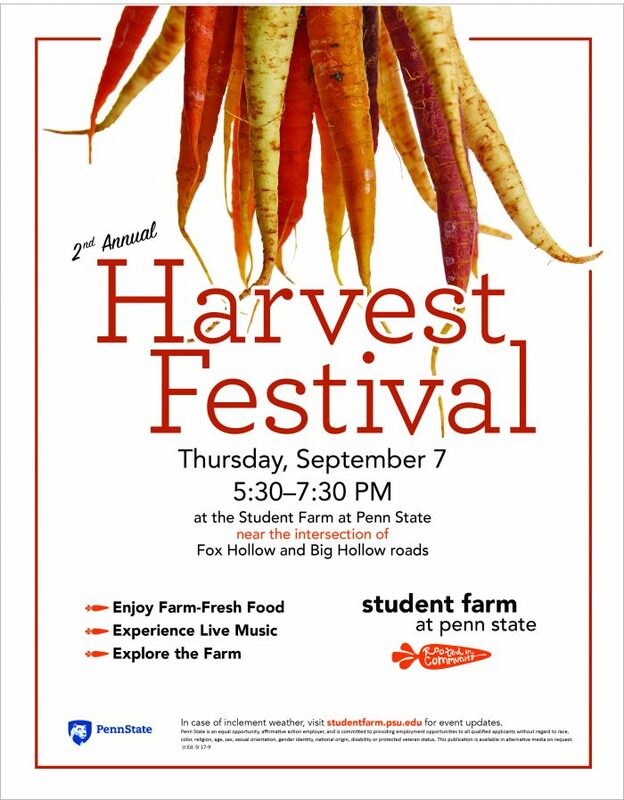 For more information about this event, contact Student Farm intern Olivia Hort at oxh5018@psu.edu. Please make sure to RSVP for the Harvest Festival to give us an accurate count for good and to minimize food waste. Help us make this a Zero Waste event! Transportation:Students and our campus community can get a ride to the farm on the blue Ag bus, departing at 5:30 and at 6:00 from the Ag Admin pullout area (near the Creamery), out to the farm. The bus will return people to campus at 6:45, 7:15 and 7:45. Anyone on campus is also welcome to bike-pool to the farm together. Meet at the seating area between the Business building and Forest Resources building at 5:10pm to bike out together. Bikers should use Big Hollow Road to get to the farm, and don’t forget a light for the ride home as it will be dusk! All students, faculty, staff, and community members are invited to spend a Friday evening at the Student Farm! This volunteer evening will include tours of the site, and an opportunity to get your hands in the dirt on the farm. We hope to see you there! Please wear closed-toe shoes and bring a water bottle and sunscreen. Children under the age of 18 must be accompanied by a parent or guardian. Directions to the farm can be found here. With questions regarding this event, please contact Micah Houston at micahhouston13@gmail.com. 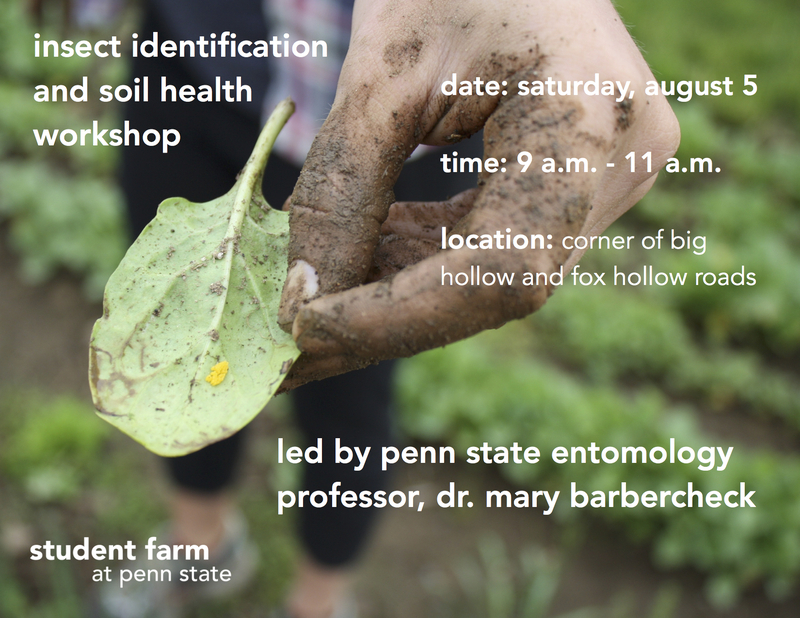 The Student Farm is hosting a free insect identification and biological soil health workshop on Saturday, August 5 from 9 a.m. to 11 a.m. This workshop, led by Penn State Entomology professor, Dr. Mary Barbercheck, will address insect and pest identification and management for home gardens, as well as lead biological soil health activities and discussions. Home gardeners of all skill levels and community members are welcome to attend and learn more about beneficial and pest insects and how they interact with plants and soil. The workshop will feature a walk around the one-acre Student Farm site to identify active insects that may be beneficial or harmful to common vegetable garden plants. Attendees will have the opportunity to see insects at various stages of development, such as egg and adult, and also learn how to identify common pest and beneficial insects. Dr. Barbercheck will then lead discussions about pest management practices that minimize the use of insecticides. Soil health activities will focus on how to evaluate and promote the biological health of your soil. Guests are reminded to wear sturdy shoes and to bring a water bottle and sunscreen. Directions to the farm can be found here. In case of inclement weather, check the Student Farm Facebook page for updates on the status of the workshop. Wind down Arts Festival week by enjoying a beautiful summer afternoon decorating flower pots and eating farm-fresh snacks! 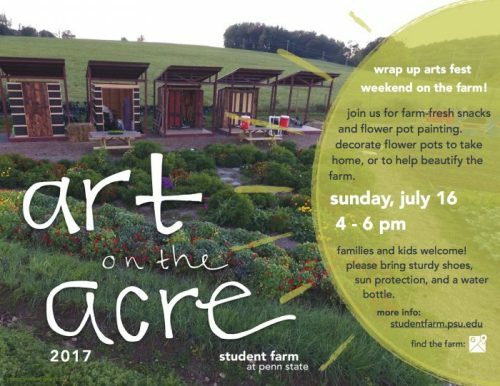 The Student Farm invites families, kids and community members to their free “Art on the Acre” event. The family-friendly event will feature flower pot painting, student-led tours of the farm and fresh, healthy snacks. Kid-friendly tours of the site will include educational opportunities to learn about different varieties of vegetables, how food is grown and how food gets from the farm to the table. Guests will have the opportunity to decorate flower pots to take home, or help paint pots that will beautify the farm. This event is free, and guests are encouraged to wear sturdy shoes, and bring a water bottle and sunscreen. Calling all gardeners! 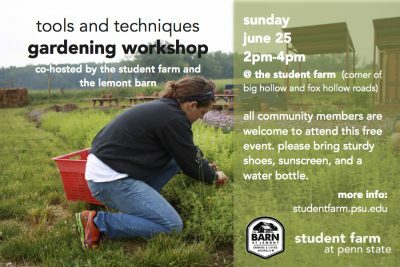 The Student Farm and the Lemont Barn are teaming up to host a Tools and Techniques home gardening workshop on Sunday, June 25 from 2 pm – 4pm at the Student Farm at Penn State, located at the intersection of Big Hollow and Fox Hollow roads. All members of the community are invited to the workshop for a hands-on experience working in the field and the opportunity to learn more about home gardening techniques and tools. Leslie Pillen, Student Farm coordinator and Brian Kinney, co-owner of the Lemont Barn, will lead hands-on discussions about gardening tools and practices. Topics will include drip irrigation methods, tools for weed management, potato hilling and tomato trellising demonstrations. Your gardening questions are welcome as well. Guests are reminded to wear sturdy shoes and bring water and sunscreen. In case of inclement weather, check the Student Farm’s Facebook page for updates regarding the workshop. We hope to see you there! Join us for a summer evening filled with live music performed by local acoustic rock band, Hops & Vines, and locally-sourced food from World’s Fare Catering. Admission to the event is free and guests are encouraged to bring money if they plan to purchase food, or are welcome to bring their own picnic dinner. Students, faculty, staff, community members, and children are all welcome to attend. This event is outdoors, so guests should plan to bring picnic blankets and lawn chairs. In case of inclement weather, check the Student Farm’s Facebook page for updates regarding the status of the event. For more information about getting to the farm, visit our volunteer page or find us on Google maps. 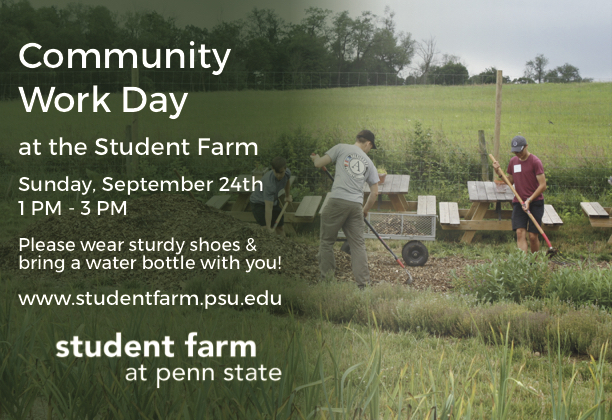 Students, faculty, staff, and community members are invited to spend Saturday morning on the Student Farm! We’ll tour the acre and get our hands in the dirt. More information about the event can be found here, and directions for getting to the farm can be found here. 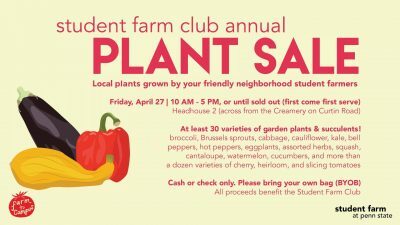 Save the date for Student Farm Club’s third annual plant sale! Student-grown vegetables and herbs will be available for sale, with all proceeds supporting the Student Farm. Please bring cash or check, and your own bag or box for your seedlings. Where: Rm. 350, Health & Human Development Bldg. Wrap up your Central Pennsylvania Festival of the Arts (Arts Fest) weekend on the Student Farm! Join us THIS Sunday, July 17th, between 4-6pm for farm tours, farm-fresh snacks, and flower pot decorating. Tours will start every half hour, with the final tour starting at 5:30pm. This event is free and open to the entire community, including families and children. Visitors can help paint pots for the farm, and paint a pot to take home! Clay pots, paint, brushes and vegetable stamps will be provided. We ask that you wear closed-toe shoes, bring a water bottle, and wear clothing that you don’t mind painting in (we will also provide paint smocks). 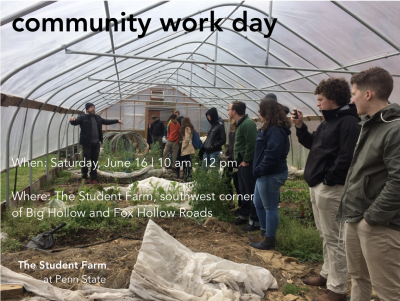 The Student Farm at Penn State is located at the intersection of Big Hollow Road and Fox Hollow Road. Parking is available on the street. We hope to see you there! Join us for a Community Volunteer Day at the Student Farm! 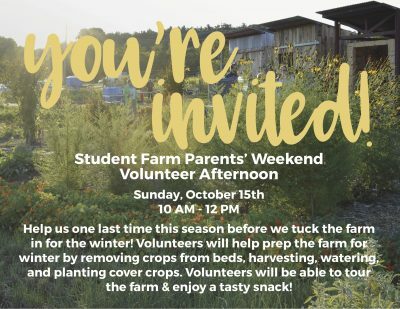 Students, faculty, staff, and community members are invited to spend Saturday morning on the Student Farm where we’ll spend some time touring the acre site and discussing our progress this season. 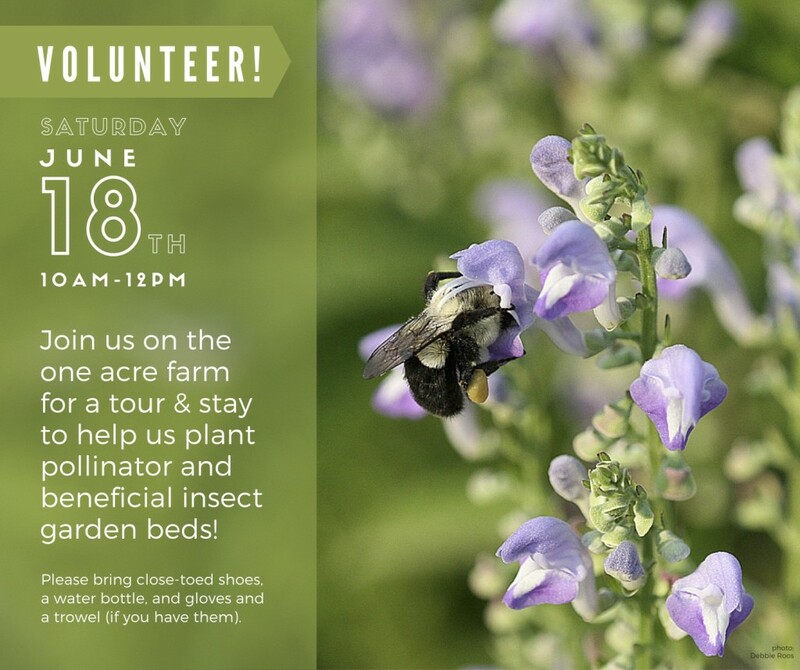 Following our tour, volunteers can lend a hand in growing our initiative by planting pollinator and beneficial insect garden beds around the acre! What to bring: closed-toe shoes, water bottle, and gloves/ trowel if you have them!